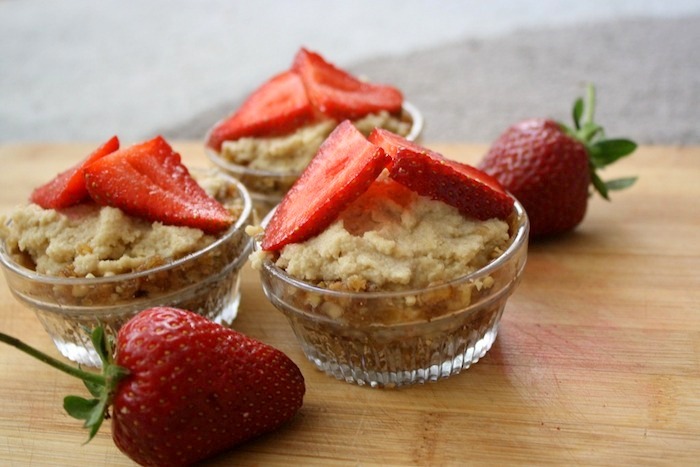 The following recipe is for a raw vegan cheesecake that is separated into smaller, bite-sized mini ones. All it takes are a few ingredients and a bit of foresight (to soak the cashews), and in a few minutes, you can whip up these sophisticated mini cheesecakes that make for the perfect portion size. Enjoy! I’ve always resisted making nut-based raw desserts, because I firmly believe they defeat the purpose of eating healthy, since nuts are quite heavy and it takes a lot to make just one slice of cake. 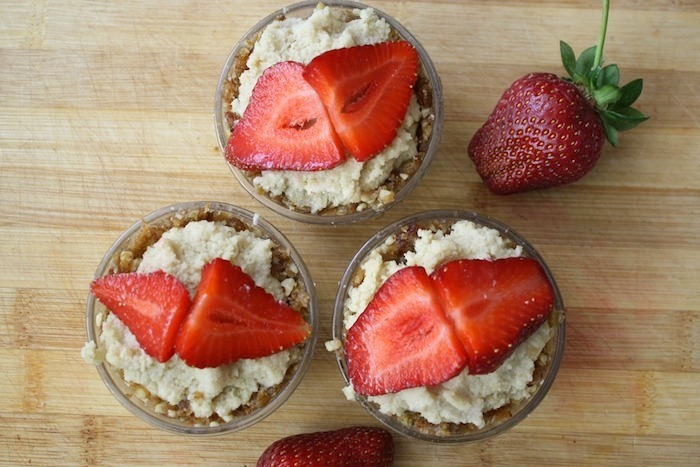 A handful of nuts is all you need to benefit from their heart-healthy fats and vegan protein, but nut-based raw desserts are a slipper slope. Just because something has a raw or vegan label does not mean it’s going to do your body good. I mean, sugar is vegan and uncooked meat is raw. It’s important to pick and choose under the umbrella of a raw or vegan diet, and it helps to look at things in terms of density rather than labels. The denser the food is, the more difficult it will be to digest. 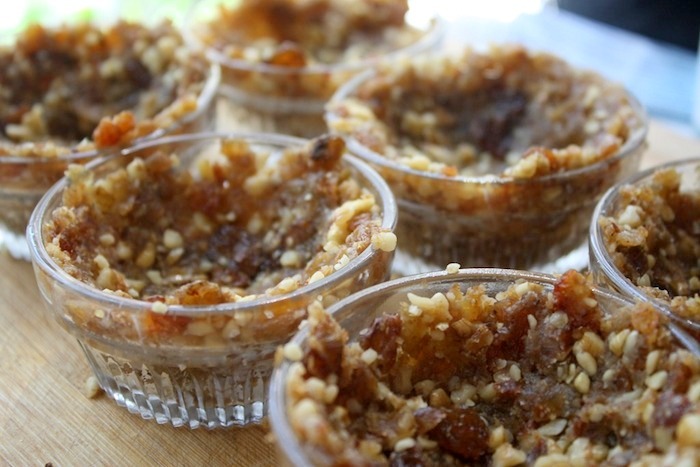 For the crust, food process the raisins and walnuts until the mixture resembles chunky crumbs. Press the crust against the bottom and sides of small glass ramekins (or any size base you desire). 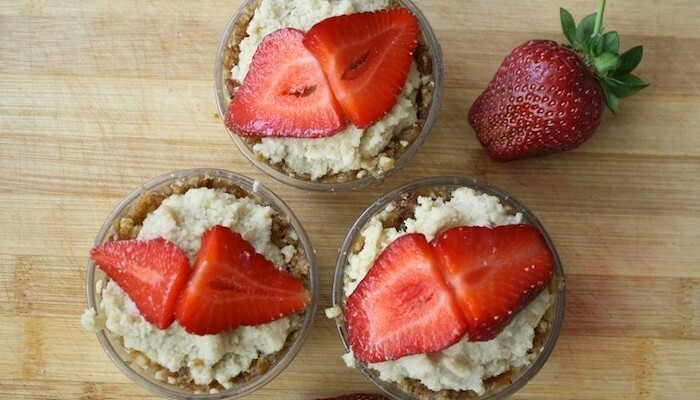 For the filling, use cashews that have soaked overnight in room temperature water. Rinse before use. This is an important step. Soaking helps to remove the enzyme inhibitors that the cashew carries around to prevent it from sprouting in nature. Birds are too small to deal with the effects of live enzymes in their tiny bellies, so the inhibitors are ideal for them, but not so much for humans. Getting rid of the enzyme inhibitors through soaking helps us to more easily digest nuts! All nuts have to be soaked to get rid of these enzyme inhibitors, save for pistachios and walnuts. Combine all ingredients in a food processor and mix until smooth. This may take a few minutes. Be patient – it’ll come together. 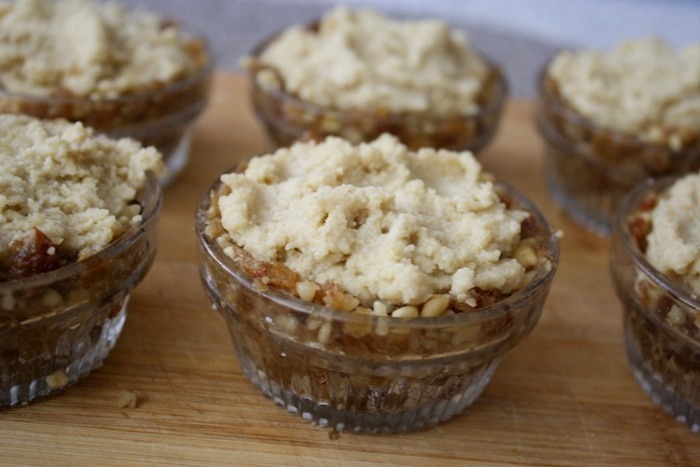 Fill each walnut crusted ramekin with a generous tablespoon. This entry was tagged easy dessert recipes, raw desserts, raw foods, raw vegan cheesecake. Bookmark the permalink.